The US Debt Challenge, Are There Answers To It? A reformer with results former Florida Governor Jeb Bush has pioneered the conservative way to improve education. Through the Foundation of Excellence in Education Reform it's being advanced from state to state. "First, Florida started grading its schools from A to F, based on the proficiency and progress of pupils in annual reading, writing, math and science	tests. The state gives extra money to schools that get an A or improve their grade,	and children at schools that get two F grades in four years are allowed to transfer to better schools. Second, Florida stopped letting third-grade pupils who could barely read go on to fourth grade (a practice, common all over America, called	'social promotion')." "Third, it created a merit-pay system in which teachers whose pupils pass certain exams get bonuses. Fourth, it gave parents much greater choice, with state vouchers, between public, charter, private and even online schools. Fifth, Florida	set up new methods of certification to draw more talented people into the profession, even if those people have no college degree specifically in education." As for the results, Democrats have now joined Republicans in supporting the Bush reforms and minority students have made significant gains along with other students. And from a federalist standpoint the reforms will get Washington out of education, which is a good thing. Are There Answers To It? We are all aware of runaway federal spending and deficits. President Obama has shattered the Bush debt record achieved over 8 years, in just 3 years ($4.9 trillion Obama, $4 trillion Bush). This extraordinary debt came from a president that said President Bush's debt was "irresponsible and ...unpatriotic." Obama had promised to cut the Bush debt in half. Another broken promise. We as conservatives know it's a spending problem, so how do we deal with it? First, we need to ask ourselves what programs and spending we will cut? Then, what entitlement reforms do we want? Of course the Democrats say get rid of the Bush tax cuts on the rich (gross income over $200,000), but we know it won't make a big dent in the Obama budgets. So maybe we take the next step, which means we could balance the budget tomorrow by eliminating the tax deductions for mortgage, interest, charity and 3,000 others. TCR Comment: In this forthcoming campaign we need to do what the Democrats refuse to, which is being honest with the American people about what needs to be done. Periodically, TCR updates the thinking of our Democratic/liberal friends. It is important to put in context the battle we face over the future direction of the country. (1)	Cut, Cap and Balance - Reduce non-defense discretionary spending to 2008 level; cap spending so that it falls below 20% of GDP by 2021; and pass a balance budget amendment that prohibits tax increases unless 2/3 of both Houses of Congress agrees. (3)	Eliminate the Departments of Commerce, Education, Energy & HUD. TCR Comment: Sounds like a worthy idea; all are outside of what the federal government is supposed to do and any non-deficit money they want to spend can be block granted to the states. (4)	Privatize Fannie Mae and Freddie Mac, the Transportation Security Administration, and Amtrak. TCR Comment: These are all agencies that are involved in non-governmental functions. (5)	The conservative takeover of the federal courts will be complete. TCR Comment: Good; maybe we can appoint judges that will help us reverse such antiques that violate one man-one vote, like the misnamed Voting Rights Act. (7)	A more muscular foreign policy that supports our friends and confront where appropriate, our enemies. No more leading from behind. Review what they are concerned about and it is exactly the right prescription for getting America going forward again. In fact, it is a blueprint for winning in November. My hometown of Houston, Texas has had some exceptional successes in crime-fighting and cost-cutting over the last few years. These successes can be attributed in part to policy innovations from Pat Lykos, the District Attorney. Moreover, exciting new initiatives that are based on solid research such as Judge Jan Krocker's mental health court and a sobering center are just now getting underway. I wrote about several of these innovations - and the unfinished work that Houston still has left to do - in a piece for the Houston Chronicle on March 16. You can read it by clicking here. 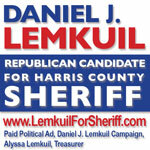 TCR Comment: Conservative think tank expert Marc Levin tells us all we need to know about re-electing District Attorney Pat Lykos in Harris County. She has brought a breath of fresh air to that office and we are safer for it. 03/30/12: "Voter ID Law Goes to Court" with Carol Alvarado, Orlando Sanchez, Sylvester Turner and Glenn Hegar. 04/06/12: "The War on Women and the Politics of 2012" with Dixie Swanson, Natalie Arceneaux, Ellen Cohen and Ana Hernandez Luna. 04/13/12: United States Congressman Gene Green.